“When you’re awake, everything is linear,” David Horvitz says as he rings a wind chime to test its sound. The chime immediately induces a dreamy state, one in which the aforementioned linear perception drifts away into the breeze. Horvitz draws from the lullaby “All The Pretty Little Horses,” specifically seven notes in the melody that are repeated throughout the song. In his installation, each note is its own chime, and appears in two different octaves. Horvitz has two sets of the seven notes in a larger chime size, and two sets of the seven notes in a smaller chime size, creating a dissonance in the experience of the melody. 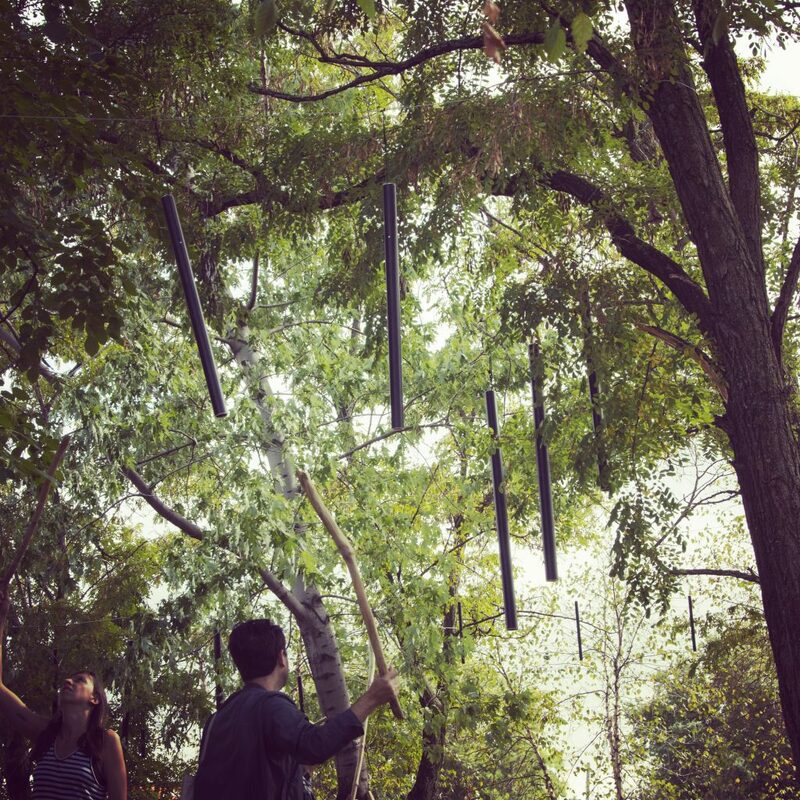 The individual chimes, scattered and hung throughout Socrates Sculpture Park’s grove of trees, are to be played by visitors, creating waves of sound that wash across the park. Horvitz’s EAF15 project Lullaby for a Landscape (All The Pretty Little Horses) seeks to create an environment that embraces the soporific. The artist’s thoughts revolve around ideas of hypnagogia, the transitional state from wakefulness to sleep, during which the onset of sleep influences the brain’s experience of time and space. Running parallel to this interest is Lullaby for a Landscape, which is a liminal space between aural sound and physical landscape, where sound is given a spatial and physical form as it embodies the landscape in which it resides. As visitors meander through the grove of trees, they may encounter gentle notes floating across the grounds as the performer plays the chimes. Once the lullaby is played through, the performer improvises to communicate the fragmented sensation that one experiences when in a state between consciousness and unconsciousness. “A lullaby is a narrative that is told to you as you fall asleep,” says Horvitz. In his project, Horvitz removes the narrative aspect of a lullaby. Without a beginning or an end, there is no completed transition from consciousness to sleep. The experience of time is caught in limbo. Horvitz has been fascinated by concepts of time, day, and night throughout his career. In past works, he has created spaces of altered temporality and situations that actively challenge the audience to reconsider their own ideas of time and space. Somewhere in the Jurisdiction of Time (2014) at Blum & Poe Gallery in Los Angeles was composed of a row of glass vessels, each filled with water collected from the longitudinal line that divides the Pacific time zone from the Alaskan time zone. Horvitz displaced the line by displaying it on the gallery floor, calling into question the significance of human demarcations and our attempt to organize time. Currently, Horvitz is in the Museum of Modern Art’s photography show, and a group show in Nuremberg, Germany.